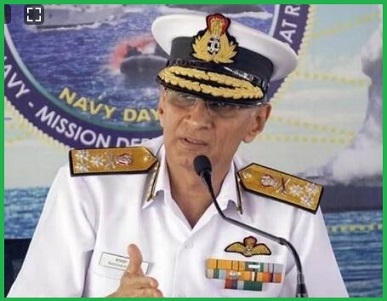 Vice Admiral Karambir Singh on 23rd March 2019, became the Chief of the Naval Staff (CNS). Vice Admiral Karambir Singh prior to this appointment had served as the Flag Officer Commanding-in-Chief (FOC-in-C) of Eastern Naval Command in Visakhapatnam. Vice Admiral Karambir Singh took over the office of CNS as the 24th Navy Chief from incumbent CNS Admiral Sunil Lanba, who was retired on 31st May 2019 after completing 3 years in office. Vice Admiral Karambir Singh will be the first helicopter pilot of the Navy to become the Chief of Indian Navy. Vice Admiral Karambir Singh (59-year-old) was born on 3 November 1959 at Jalandhar. Vice Admiral Karambir Singh is an alumnus of the National Defence Academy, Khadakwasla. He graduated from Defense Services Staff College, Wellington and College of Naval Warfare, Mumbai. Vice Admiral Karambir Singh joined the Indian Navy in the year 1980 and got a chance to become a helicopter pilot in 1982. He has fired Kamov-25 and Kamov-28 anti-submarine helicopters. Vice Admiral Karambir Singh had served for over 36 years in Indian Navy, at various command, staff and instructional appointments. He has commanded an Indian Coast Guard Ship, a Naval Missile Corvette as well as Guided Missile Destroyers.